The quarry railways at Ketton, Rutland and Barrington in Cambridgeshire used specific internal user tippler wagons to transport the raw materials for the cement making process from the on-site quarries to the production plant. 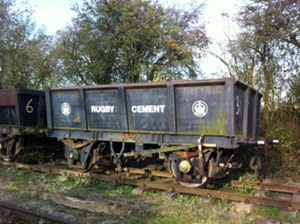 We were donated representative wagons from both railway systems and these now form a mixed rake for use in our quarry. Built by Klose by rebodying a 26-ton BR Iron Ore Tippler. Produced by rebodying a 26-ton BR Iron Ore Tippler. 4-wheel tippler built at Ketton, note the reverse hand brake levers. 4-wheel tippler built by Butterley Co., note the reverse hand brake levers.